Dalhousie University is a university located in Halifax, Nova Scotia, Canada. As the largest post-secondary educational institution in the Maritime Provinces it offers a wide array of programs, including a medical program and the Dalhousie Law School. The chancellor is Mr. Fred Fountain; Dr. Tom Traves serves as president and vice-chancellor. Dalhousie is consistently named among Canada's top research universities. It is a member of the Group of Thirteen, more commonly referred to as the G13, a group of the leading research universities in Canada. In 2003 and 2004, The Scientist magazine placed Dalhousie among the top five places in the world, outside the United States, for postdoctoral work and conducting scientific research. In 2007 Dalhousie topped the list of The Scientist’s “Best Places to Work in Academia”. The annual list divides research and academic institutions into American and international lists; Dalhousie University is ranked first in the international category. According to a survey conducted by The Scientist magazine, Dal was named the best non-commercial scientific institute in which to work in Canada. 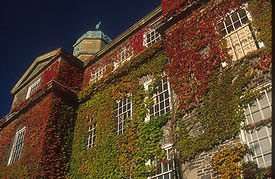 Dalhousie University was ranked as the eighth-best university (Medical Doctoral Rankings) in Canada by Maclean's Magazine in 2008. 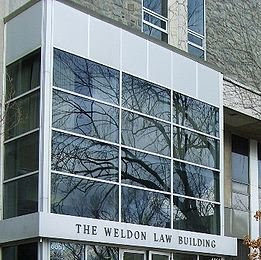 In addition, Maclean's ranked Dalhousie's law school sixth overall for two consecutive years.In the 2008 edition of the annual Times Higher Education Supplement-Quacquarelli Symonds World University Rankings, Dalhousie ranked 11th in Canada and 197th internationally. 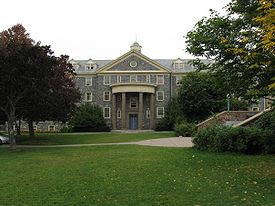 Dalhousie College was founded in 1818 as a non-denominational university by the 9th Earl of Dalhousie, at the time the Governor of Nova Scotia. Dalhousie University awarded its first BA in 1866. Using money acquired from the duties collected during the occupation of parts of Maine in the War of 1812, Ramsay established Dalhousie as a college open to all people regardless of class or creed. At the laying of the cornerstone on May 22, 1820, Lord Dalhousie said that this University was "founded on the principles of religious tolerance." Dalhousie remained one of only three universities founded on secular constitutional premises until as late as the 1950s. Although it was technically founded in 1818, Dalhousie did not have its first students until November 1st, 1838. However, following the death of the University's first principal, Thomas McCulloch, in 1843 the school was once again allowed to fall into inactivity. Dalhousie did not permanently open its door again until November 10, 1863. 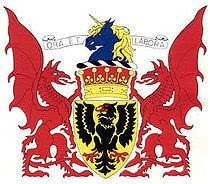 In 1876 the experiment was commenced in Halifax, Nova Scotia of a University to hold examinations in arts, law, and medicine, and to confer degrees. Dalhousie was distinctive as an urban institution, situated in downtown Halifax on the site of the present City Hall. This status was seen not only, in the early days at least, in the use of much of the college's lowest floor as vault space for Oland Brewery, but also in the consistent drawing of about one-third of the student body from the city and in the college's ability to draw upon local professional populations in the establishment of professional faculties such as medicine (1868) and law (1883). Finances remained difficult into the 1880s, but by the end of that decade the accumulated donations of the philanthropist George Munro, brother-in-law of Board of Governors member John Forrest, had provided the stimulus that led to growth in student numbers and the emergence of Dalhousie as a centre of scholarship acknowledged throughout the dominion. Dalhousie's colours of black and gold come from the jerseys worn by the Dalhousie University Rugby Football Club (who still wear those colours, as well as the school crest on their jerseys). The Halifax Conservatory became affiliated with Dalhousie in 1889. In 1920 the University of King's College in Windsor, Nova Scotia, English Canada's oldest degree granting institution, burned down. Through a grant from the Carnegie Foundation, King's College was able to relocate to Halifax and entered into a partnership with Dalhousie University. While often seen as a separate but integrated institution, King's shares Dalhousie's Arts and Sciences Faculty, but offers several interdisciplinary humanities degree programmes, such as Contemporary Studies, History of Science and Technology and Early Modern Studies. In 1936, the Institute of Public Affairs was established at Dalhousie University. Dalhousie expanded its presence in south-end Halifax during the 1960s and 1970s when it built the Dalplex athletic facility, the Killam Library, the Life Sciences Centre, the Dalhousie Student Union building and a district heating plant, all on what is referred to as the Studley Campus (the main campus). Also at this time, Dalhousie built the Tupper Building for its Faculty of Medicine and expanded existing buildings to house the Faculty of Dentistry and College of Pharmacy, all on the adjacent Carleton Campus, located immediately to the east of the Studley Campus, and co-located with two of Halifax's teaching hospitals (the Victoria General Site of the Queen Elizabeth II Health Sciences Centre and the IWK Health Centre for Women, Children, and Youth). Nova Scotia Technical College in Halifax launched its program in architecture in 1961. Nova Scotia Technical College was later the Technical University of Nova Scotia (TUNS). 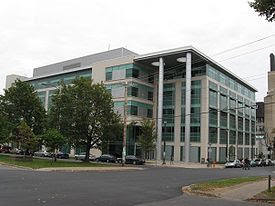 Following a period of government-mandated consolidation of post-secondary institutions during the 1990s, the Technical University of Nova Scotia was merged with Dalhousie University in 1997. It was initially known as Dalhousie University Polytechnic, or DalTech, but in 2000 the DalTech nickname was dropped and the engineering, architecture and computer science faculties of TUNS were fully integrated into Dalhousie University. The Faculty of Engineering and the Faculty of Architecture and Planning are located on the Sexton Campus, east of the Carleton Campus and closer to downtown Halifax. 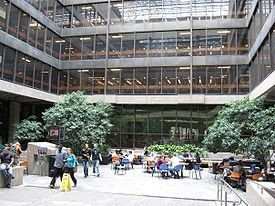 The Faculty of Computer Science moved to its own building, the Goldberg Computer Science Building on Studley Campus, in 1999. Dalhousie is part of the Canadian Ivy League. Among North American universities, only Harvard, Yale, Princeton, McGill and the University of Toronto boast more Rhodes Scholars than Dalhousie.